The best way to make Parish Registers easily accessible to the public is to transfer the records to CD-ROM. These CDs are easy to use, and holds all the information on a particular Parish or set of registers/records. 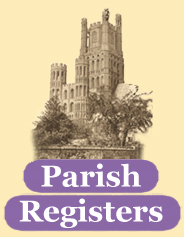 The Parish Register images can be viewed using the Adobe Acrobat browser provided with the CDs. They are bookmarked, allowing easy navigation. Once images are displayed on your screen, you can zoom in and out, move the image around, and even rotate the image 90 degrees, something that can be useful when printing. 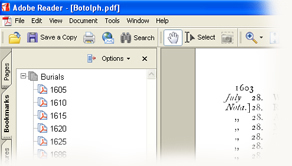 Each page has been scanned several times to get the best possible results. If some are missing or unreadable, those images are obtained and included on the CDs.